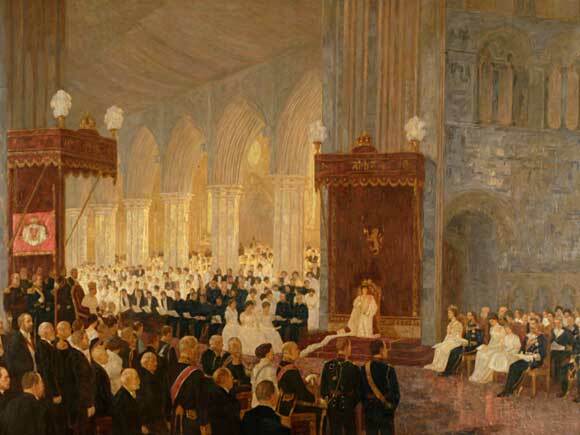 On 22 June 1906, King Haakon and Queen Maud were crowned in Nidaros Cathedral in Trondheim. It was the last coronation to take place in Norway. In accordance with Article 12 of the Constitution of 17 May 1814, the King was to be crowned and anointed in the cathedral in Trondheim. By 1906, however, the Article relating to coronation was under debate. Many viewed the custom of coronation as archaic and undemocratic. As a consequence, the coronation ceremony for King Haakon and Queen Maud was more subdued than those held in previous years. 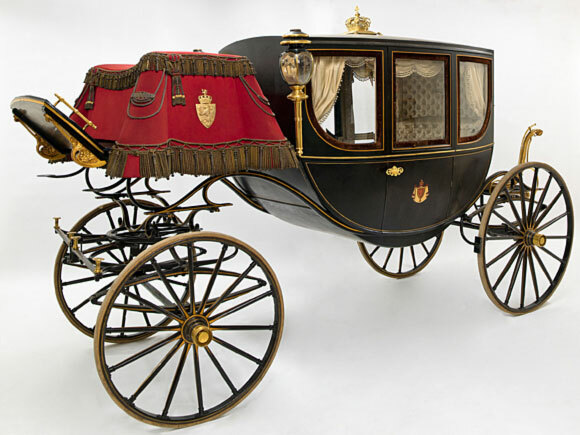 For instance, the traditional coronation procession from Stiftsgården to Nidaros Cathedral was eliminated, and instead the King and Queen were escorted to the cathedral in a coronation coach drawn by four horses. In line with the tradition begun by King Carl John, King Haakon was crowned in uniform, while Queen Maud broke with tradition by selecting a gown without Norwegian symbols. The two previous queens had worn gowns adorned with the Norwegian lion. On their way to the coronation, King Haakon and Queen Maud travelled by train, horse and carriage, and ship. They arrived in Trondheim on the ship “Heimdal” and were greeted by a large crowd of well-wishers at Stiftsgården. They had stopped many places during their voyage, as the coronation journey also served to acquaint the people with their new Royal Family and the Royal Family with its new people and country. The trip back to Kristiania was made by ship along the coast. The Royal Family left Trondheim on 10 July and reached Kristiania on 1 August. The journey was completed the following year with a longer tour of northern Norway. The custom of making a long journey through large parts of the country in connection with a coronation or consecration dates back to the medieval kings, who were hailed at the various assemblies located throughout the realm. Although Nidaros Cathedral was under restoration at the time, the entire nave was opened for use to accommodate the largest possible audience. Over 2,300 people were in attendance at the cathedral. The ceremony was performed jointly by Bishop Vilhelm Andreas Wexelsen of Nidaros and Bishop Anton Christian Bang of Oslo. The King and Queen took their seats on the coronation thrones from 1818, which were positioned side by side under a canopy below the central turret. The service began, and following the first section of Johan Halvorsen’s coronation cantata, the coronation was performed. 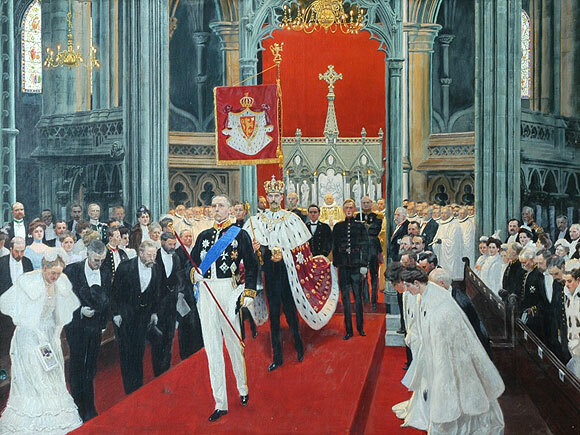 King Haakon, attired in the coronation robe, stepped forward and knelt before the high altar. Bishop Wexelsen anointed the King’s forehead and wrists. The King then seated himself on the coronation throne that was positioned in front of the high altar, and Prime Minister Christian Michelsen and Bishop Wexelsen together placed the crown on the King’s head. Minister of Foreign Affairs Jørgen Løvland then presented the King with the royal sceptre, while Minister of Trade Sofus Arctander presented the royal orb. The sword of state was presented by Minister of Defence Wilhelm Olssøn. Bishop Wexelsen said a prayer for the King’s solemn duties and offered a blessing. The King then returned to the coronation throne under the canopy, wearing the coronation robe and bearing the royal regalia. Following the third section of the coronation cantata, Queen Maud stepped forward. The Queen was anointed and crowned following the same ritual used for King Haakon. She then returned to the coronation throne bearing her robe and regalia. President of the Storting Carl Berner concluded the ceremony by stating that the coronation was complete, urging the attendees to join him in declaring “God save the King”.